As I mentioned earlier, Ben’s post covered item #1 above, so in this post, I will show you how to solve items #2 and #3. How Much Are Users Scrolling on each Page? 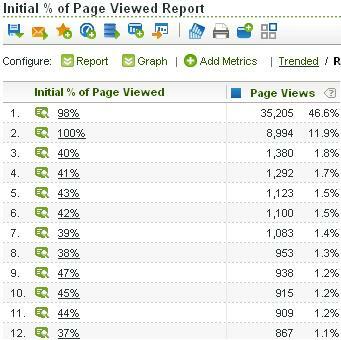 Total % Page Viewed. This is the first of the two values and this classification replicates what Ben blogged about. Scrolling %. This is the second value and represents the % of the page the visitor scrolled to see. 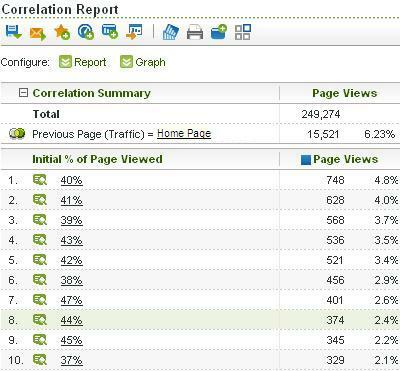 In this case it looks like about half of the time visitors are scrolling on the Home Page. Finally, if you want, you can bucket these Scrolling percentages into more meaningful groupings by adding additional SAINT classification columns as Ben described. 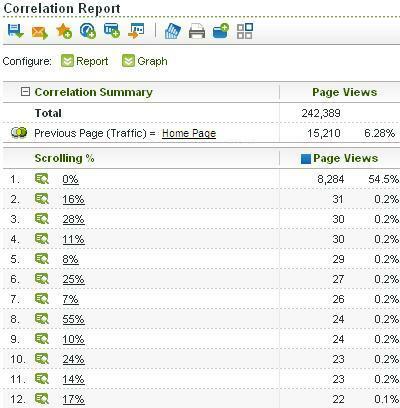 What % of the Page Do Visitors See Upon Page Load? So the other thing I wanted to see was the percentage of the page that visitors see before scrolling. I don’t like looking at Browser Height pixels, but would rather simplify things and see the exact % of the page my visitors are seeing – period! Unfortunately, there is not an easy way to do this in SiteCatalyst. However, when I was looking at the above items in this plug-in, I realized that the answer to this question was a side-benefit of doing the SAINT Classification shown above. Think about it…we have the Total % of the Page Viewed and the Total % that visitors scrolled, both concatenated in an sProp as shown above. If you subtract these two values, you are left with the percent of the page that visitors saw before scrolling (in other words, upon page load)! 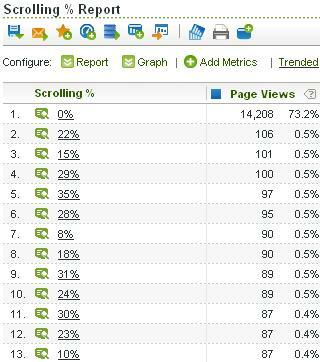 For example, if the value in the sProp is “58|10” (see first row of example above), then we know that the visitor saw a total of 58% of the page and they scrolled 10% of it, so they must have seen 48% of it initially (good thing web analysts like math!). OK…I know this sounds complicated, but really all you need to do is slightly modify the code (see below) that Matt Thomas (of Omniture Consulting) created and that Ben alluded to in his post to add one concatenated value (% Scrolled). The majority of the hard work is in building the SAINT classification file to get all of these cool, new reports. Well the good news there is, that I have already created the file which you can use as a starting point for these extra reports. All you have to do is to download it by clicking here (save .TAB file to your hard drive). Simply save this file and add the values to your own SAINT template after you have created the Classifications mentioned in this post. So there you have it…a few additional ideas for you to ponder while you have % of Page Viewed on the brain… If you have other ideas or questions, please leave a comment here…Thanks! Adam, great stuff as usual. In testing the core code from Omniture, my engineer found a bug that exists in your version as well. When the document height is LESS than the browser height, the scroll is reported incorrectly. In these cases it should be 0 scrolled & 100% viewed. Instead, both plug-in versions report what appears to be the percentage of the viewport that is filled by the document. We’re writing a workaround to basically reset the values if viewport => doc height. 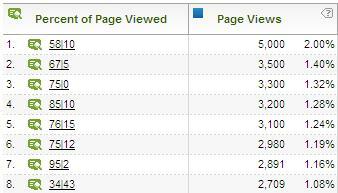 We don’t have too many pages that are that small, but if they’re popular it can really screw up the aggregate data. Hi Adam – great suggestions. Will try and get this applied for a client in their next release. I will talk to my developer about this. Thanks! Have you considered to remove the bounce rate on your calculation? It’s normal that 60% of your visitors do not scroll when you have a +40% bounce rate…. Doesn’t the plugin ignore bounces by default? I mean, it records scroll in a cookie, but only reports it to Omniture on the second page view within the same domain and same visit. If they bounce, the scroll data never gets reported to Omniture, right? Does the plugin account for the starting scroll position of a page. For example, if the page loads pre-scrolled to an #anchor point at the bottom of the page… it would be nice to know that the user hasn’t seen the entire page yet. Hi Adam – is the code above your final version or was it amended at all during the past few months? @adamgreco in your post on Advanced Percent of Page Viewed https://analyticsdemystified.com/adobe-analytics/advanced-percent-of-page-viewed/ SAINT file http://dl.dropbox.com/u/16460/ScrollingClassificationFile.tab is not opening HELP! Hello, I have a quick question. What if the site only has one long page (no previous page). Will this plugin still work?